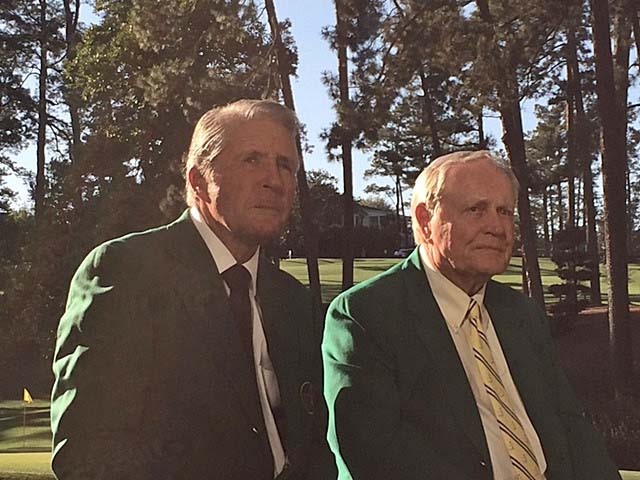 Record six-time Masters champion Jack Nicklaus and his good friend Gary Player, a winner of three Green Jackets, will hit ceremonial tee shots to start the 81st Masters Tournament around 7:45 a.m. ET on Thursday, April 6. Missing from this decades-old tradition will be fellow “Big Three” member and four-time Masters champion, Arnold Palmer, who passed away last September at the age of 87. Ahead of hitting the tournament’s opening tee shot, the Golden Bear said Palmer was very well represented at the Champions Dinner on Tuesday during Masters Week when all but one living Masters champion assembled for one of the greatest annual gatherings in golf. Nicklaus joined ESPN’s Mike & Mike Wednesday, where the popular show hosts asked him how this year’s Masters Tournament will be different without his long-time competitor and friend. And there you have it—even at 77 and 81 years old, respectively, and missing a third of golf’s greatest triumvirate of friends and competitors—Nicklaus and Player will vie for bragging rights. “Chuffed when you know keeping in shape just helped you drive by your friend’s ball,” Player joked on Twitter, to hint at an unofficial Honorary Starter long-drive competition. The Honorary Starters tradition will be available to watch on masters.com.